Unless you have generated strongly typed classes, looking up Optionset values for the selected value or any other value, is one of the most annoying things to do as a developer. You can use the bookmarklet below to display Optionset values, along with the Optionset text for all the Optionsets on a form. You can drag the minified source to your bookmark bar, for creating the bookmarklet. 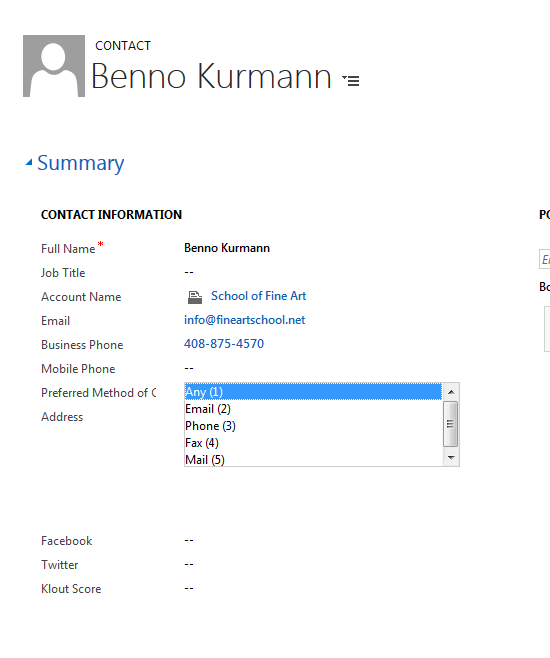 This is how a sample contact form looks after executing the bookmarklet. But you should not control text.indexOf(‘ (‘) === -1 this. Some time option set text contains ‘(‘ like “English(U.K)”. In my scenario I never have any option sets that have a bracket in the text. I put that line in so that even if you run the bookmarklet multiple times it would still produce the same text. It is a choice between a character that looks nice and removing the capability to run the bookmarklet multiple times and producing the same result. What solution do you suggest? If you change if (o.text && o.text.indexOf(‘ (‘) === -1) to if (o.text ), it will work even if you click multiple times like before. One other reason I did it this way, is not to delete and re-add the options when I see a “(” in the options. This signals to me that it has already been processed and I don’t need to append the text and values again. It probably doesn’t make a huge difference in performance if I do it all again I guess.